Ren gauged the sky by clouds, how dense they were against August west hills. When they sat high above the hills, like loose bones on taunt skin, he threw an old mustard-colored blanket upon the backyard lawn. The lawn was a sea storm of bumps, weeds, and grass, but after a while his back adjusted, conformed to the waves, and while buzzed on a couple of ales, looked up into the sky, which was blocked, partially, by an overgrown fig tree and a couple of out-of-control bushes. He was not good at maintaining the yard. The neighbors, in an innocent passive-aggressive style, let him know this. Kate would come over from time to time, sit with him, with a cheap bottle of wine from Trader Joes, riding a rattle-trap Schwinn to look at the sky with him. So much looking upwards, they thought they found something. The house’s paint had cracked by being exposed to that same sky, along with the wood siding that was splintered and there was even a cinder block, painted green, plugging a hole in the roof. The neighbors politely didn’t mention these things, though they worried about their property values. Neither did Kate…mention these things. Nicely done – people often think only of property taxes and not of their neighbors. 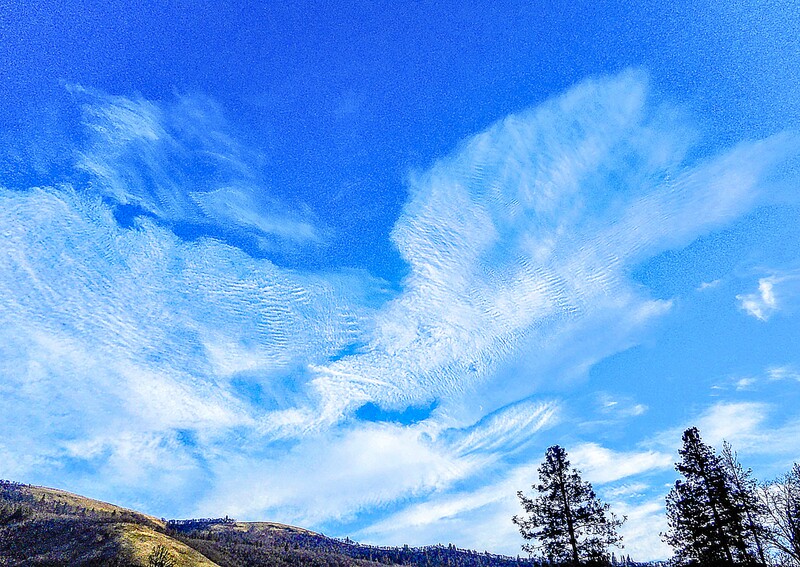 Love the cloud photo – looks like angel’s wings! Unlike JT who first commented, I can see an eagle in the clouds instead of an angel. Ahhh, I see. Perhaps there are both. Beautiful sky and story. Well written as usual. you certainly have a way with imagination and the old writer’s tool of using great telling sentences. Good job. I have added many stories the last few days. I would love your input.